Founded in 1889, the RSPB is the UK charity that exists to conserve wild birds and the environment. It is the largest wildlife conservation organisation in Europe with over one million members. From its initial stance against the trade in wild birds’ plumage the issues that the Society tackles have grown widely over the years in both number and size. The RSPB focuses its work on the species and habitats that are in the greatest danger and campaigns on behalf of the birds and environment. It owns and manages over 180 nature reserves nationwide, and is active at a regional, national, and local level. As well as its 1500 full and part-time staff – from nature reserve managers to computer analysts – in its ten regional offices across the UK, the Charity has the support of over 170 local members groups, and over 11,900 volunteers annually. The central IT department invested in Hornbill’s Supportworks helpdesk management system to support its country and regional offices and nature reserves with communications and business systems. 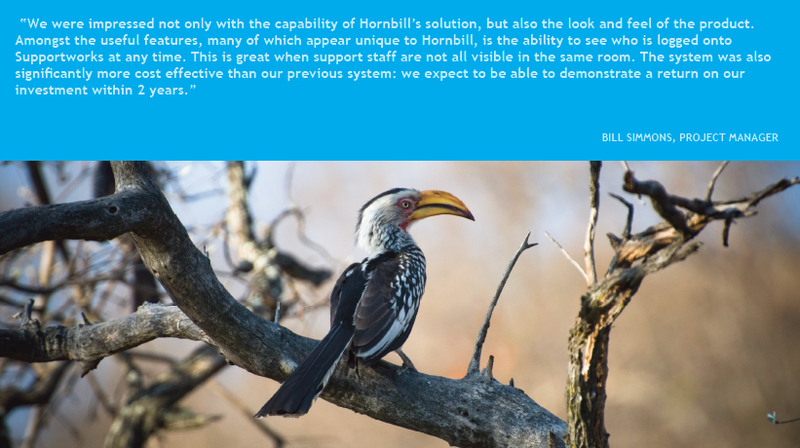 The RSPB team initially chose Hornbill’s solution to replace its existing helpdesk system, an add-on to a large corporate system rather than a specific chosen solution. Following an internal review, the IT department wanted to introduce new business processes and procedures, and found its incumbent helpdesk system inflexible and costly to maintain and upgrade. To carry out active projects and to be able to focus its work, the organisation like many others, relies upon its IT systems – desktop and purchasing, databases and email – to operate effectively. The tender was presented to thirteen companies, of which five were shortlisted to attend a presentation. Hornbill won with flying colours. The IT department has over twenty regular users of Supportworks, of which ten provide first line support and five second line support. Three team managers, a change control manager and one member dealing with stock requests complete the IT team. The IT department provides a range of support to its internal customers, comprising all of the RSPB’s staff members, including both established employees and volunteers. The team has to cover a wide range of queries – from purchasing and operational advice on computers and computer-related devices, to business system support on the organisation’s finance and HR systems. The hardware maintenance is handled by outsourced service providers. Following the implementation of Supportworks a return on investment is expected within 2 years. The support team has taken call tracking a step further. Working with Hornbill’s consultancy team, a bespoke ‘Next Contact Date’ traffic light system has been developed against every open support call. The light changes colour – based on business logic provided to Hornbill’s team – enabling the support analysts to keep customers informed of the current status of calls within or before pre-agreed times. Previously it was difficult to track and follow calls, and build up a database of common problems. 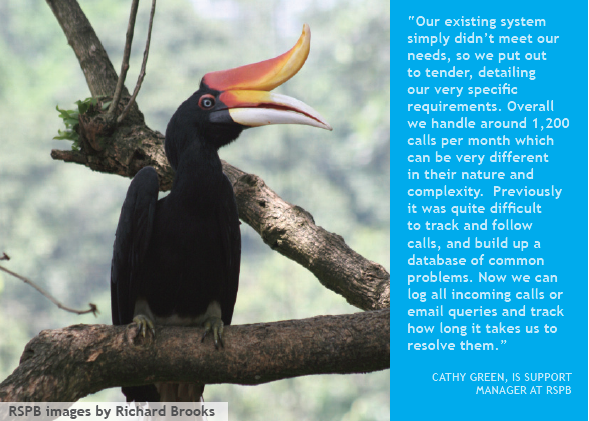 Now RSPB can log all incoming calls or email queries and track how long it takes to resolve them. Using the new system enables the IT team to meet targets that it has set out. In addition to the ‘traffic light control’ system, Hornbill has provided bespoke reports that the IT team uses to monitor its service performance. Until Supportworks, RSPB had no way of knowing how well they were managing support calls. Now, with better controls and call statistics, the team has a very clear picture of its performance. Customers no longer have to chase for updates and now trust the team to deliver solutions on time. Some internal customers also take advantage of the web SelfService support option. The IT department is continually adding common problems and solutions to the database to enable customers to benefit more from the SelfService option.